Lecture Capture: No Longer Optional? Lecture capture has been gaining momentum in recent years, but that momentum is being outpaced by student demand. According to new research released this week by the University of Wisconsin-Madison involving about 7,500 undergraduate and graduate students, an overwhelming 82 percent of students said they would prefer courses that offer online lectures over traditional classes that do not include an online lecture component. The researchers also pointed out the implications for these findings extend well beyond the classroom. These survey results stand in stark contrast to what is actually happening on campuses. According to our own informal online poll of higher education professionals, about 60 percent of institutions do not routinely make captured lectures available to students online. Thirty-three percent make them available to students routinely, and 7 percent make them available online both to students and to the public. Clearly students are demanding more. When asked why they prefer courses that offer streaming lectures online, most students cited making up for missed classes, convenience, improving retention of materials covered, improving test scores, and help with material review prior to class. The benefits for students, then, are fairly broad. And institutions would be serving their constituents better by providing this content for them, according to the researchers. Said Veeramani: "There are ... some significant common drivers that academia is wrestling with: first, creating more effective learning outcomes for students and second, accommodating more students from a scalability standpoint. To accomplish this, institutions are increasingly turning to lecture capture technologies that turn a traditional classroom into an instant source of online, interactive content." But colleges and universities still have some way to go, even with some of the basics. Again, according to our own informal online poll, only 17 percent of higher ed institutions have half or more of their classrooms on campus equipped for classroom capture. The majority, 71 percent, have one-quarter or less of their classrooms outfitted for capture. And, interestingly, 72 percent of higher education professionals indicated that, as of mid-August, their institutions did not have any kind of formal intellectual property policy in place to deal with captured lectures or other learning materials placed online, according to one of our informal online polls. But besides student interest in streaming lectures, the researchers also suggested the implications trickle down into other areas of institutions' operations. More than 50 percent of the students surveyed said they want course material to be avaalble to them even after the complete a course. According to the report, "They expressed interest in accessing online material in their professional lives, after their coursework is complete." 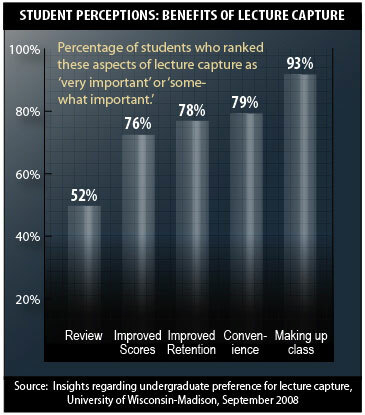 Sixty percent even indicated a willingness to pay for lecture capture services. Of those, 69 percent sad they'd prefer to pay for such services on a course by course basis. "It is clear from the survey results," the report concluded, "that undergraduate students would value the webcasting of lectures and that, given the choice, would prefer a course in which lecture content is recorded and streamed over one that is not. Results showing interest in having course material available online after course completion indicate potential benefits for alumni interaction and continuing professional development." A complete copy of the report, Insights regarding undergraduate preference for lecture capture, can be downloaded in PDF form here.